My title suits this post much better than WIP Wednesday would. You look at the photo below, and I guarantee you, you'll say WTF?? 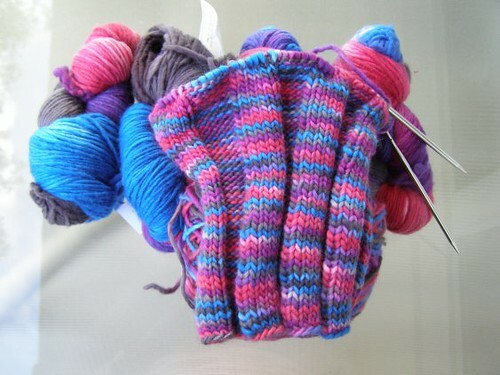 This is my "Girl's Best Friend" sock (Knitpicks pattern). It's curling worse than my hair on a rainy day in July, too, so it's very hard to photograph at this stage. I believe that curling sock, unlike my hair, will be lovely when worn. The yarn is Silja that I bought several years ago at SAFF. Hey, Ravelers on the SAFF group, I wonder if this qualifies as knitting something from your SAFF purchase! LOL! I love the yarn. It's so sproingy. The color is more a mulberry in real life, but this is a hurry up and get it posted kind of picture taken indoors. Michele Gerard knows what he's talking about, and his quote I used yesterday still applies. HOWEVER, moving on! I have a FO to share today. 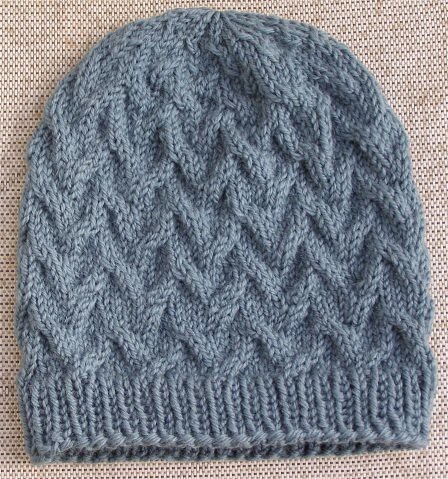 This is the Cap Karma Hat with modifications by Jared at Brooklyn Tweed. Like Jared, I wasn't too fond of the abrupt change from the cables to plain stitch at the decrease portion of the crown. I like the way Jared tweeked the original pattern to carry the cables all the way to the top! I whipped out this hat with just a few hours knitting time, so, this may be a pattern to keep in mind if you need a last minute Christmas gift. 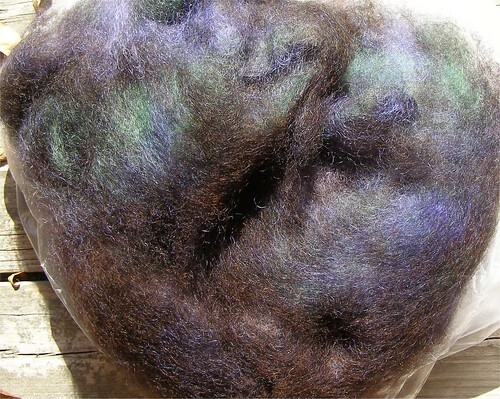 I used about 2/3 of a ball of Brown Sheep Nature Spun, and the color is Eucalyptus. People are particularly stupid today. I can't talk to any more of them. The title pretty much sums up my feeling on the on line forum world today--not limited to one particular site either! Actually, I've been thinking this for the past several days. Maybe it's all the turkey people ate over the holiday weekend that did them in. I should stop reading the local "whine line" in the paper, because that just makes me think that I live in a very racist and biogted area, or you'd think that if your only view of our area was the local paper whine line or letters to the editor. We won't even go into details about the people at work. Let's just say it is a good thing I am regionally based, or some of those folks may just end up hanging by their toes after I got hold of them. I have no intention of coming near the computer tomorrow, maybe not even all weekend, so I want to take time now to wish you all a Happy Thanksgiving. We traditionally keep Thanksgiving for just the three of us--no big family meals or travel or any of that. I make the traditional holiday feast which provides plenty of leftovers to get us through most of the weekend at least until we get sick of turkey! It's nice to have the time to relax and just do whatever we want to do. We attended the girls' and boys' varsity basketball games last night at daughter's school. Daughter had to be there with the cheerleaders, so we decided to make a family night of it. It was fun. Both teams won their games by a healthy margin which just added to the fun. I tried to get some photos, but for some reason most of the pictures I take in the gym turn out blurry. Maybe it's the funky lighting? I need to pull out the camera manual and see if there is some setting I can change. My Mr. Greenjeans is coming right along. I'd love to be able to finish it up over the weekend. Here's a progress photo, but the color is way off! I love the yarn--Paton's Merino in Cranberry. I snagged a bunch of this yarn when Michaels had it on sale for $3.50 a ball and have enough for three different sweaters. 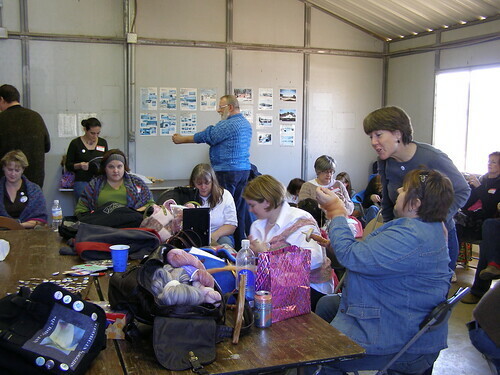 Oh, if you are on Ravelry, I have organized a CSRA Knitters group. Feel free to join us. I sent out a lot of invitations to the group but may have missed some people. 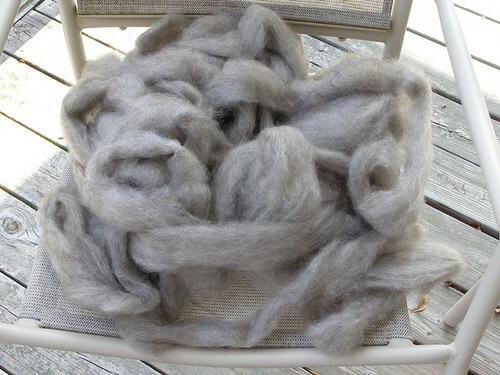 I mentioned in my last post that fiber had been purchased at our guild flea market sale. Here's my loot. The lemon yellow ball is 4 ounces of merino. I have no idea why I needed yellow, but the color was so pretty that I had to have it. It only cost $5, so that was also incentive. The multi colored hank purchase was all Hockeymom's fault! I wouldn't have gotten it except she got some and made it sound so good! The goal is sock yarn. We shall see how that plays out. This is also 4 ounces, and both of these were purchased from Gale Evans. Here we have 8 ounces of lambswool/mohair blend. It is soft as a cloud. I have no idea what this will be, but it needed to come home with me. I got some spinning done last night and finished up with some fiber purchased at SAFF. Tonight, I'm going to try to ply it and then decide on a project depending on my yardage. Photos will be coming soon! How's that for an original post topic? I looked out the window, and it just seemed obvious. Today is a gorgeous, sunny day, though I'd be as happy if it were pouring buckets. GA/SC is still in a severe drought, and we could really use the rain. We drove up to Atlanta yesterday for our guild meeting, and it was painfully obvious from looking at the lake on the way how water deprived the area really is. One of our guild shepherds was talking about the hay shortage and having to haul in water to keep her flock going. Anybody want to take up rain dancing? What could it hurt? 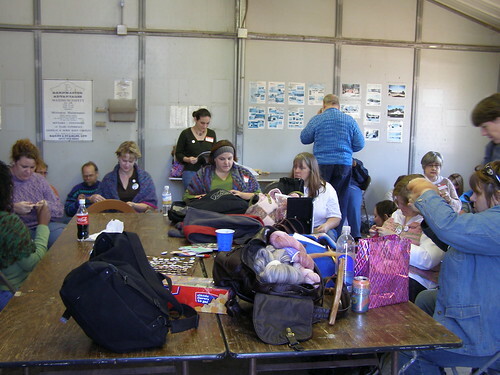 We had a wonderful time at our guild meeting yesterday and got to visit with a lot of friends. It was especially nice to have some time to sit and chat with Hockeymom. Claudia was there, too, and I don't know which other bloggers. Yesterday was the annual flea market, and I managed to escape without too much financial damage. After the meeting, we headed back toward home with, of course, a stop at teenage girl heaven (aka THE MALL) planned. We'd not eaten lunch prior to the guild meeting and all three of us agreed that shopping on an empty stomach was not optimal. We had a wonderful steak dinner at Bugaboo Creek Steak House. We'd never been to this restaurant or even heard of it. The decor was warm and cozy, kind of a Canadian Rockies thing going on. I wish we'd had room for dessert, because that giant chocolate chip cookie topped with icecream served in a cast iron skillet looked mighty tasty. With our stomachs pleasantly full, we went in search of "dress clothes" for the girl. We made out pretty well on the sale racks at Macy's, splurged a tiny bit at Dillards, and finished up the evening with a stop at DSW Shoe Store. I think we did well. Years ago, I used to bake sour dough bread. It was delicious. Unfortunately, life interefered, free time was non-existant, and my bread starter died. I also managed to lose the recipe somewhere along the line. At some point in the not too distant past (read, a couple of years ago), I found a recipe that sounded very similar to the old bread recipe. I stashed the recipe away and finally made the time a week or so ago to pull it out and get the starter going. That thing took off like gangbusters and it smelled so good--sweet and alcoholic at the same time. I mixed up the dough last night and left it to rise. It did really well, part of the dough managing to escape the confines of the bowl! 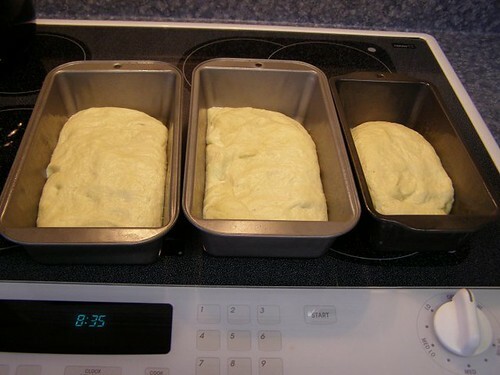 I have three loaves set to rise right now, and if all goes well, we will enjoy freshly baked bread with dinner tonight. Even though it's Monday, things are looking up from a fibery perspective. I took a little trip to Michaels on Saturday evening and scored Patons Merino at $3.50 a ball. I bought enough to make a Mr. Greenjeans for me and one for daughter. Mine will be in burgandy, and hers will be in leaf green. I may try to get back by Michaels to get another color. The $3.50 sale is off, but they are supposed to have all yarn on sale this week. I swear to stay clear of anything "ick-rylic." Natural fibers only for me from now on! Husband managed to get my Lendrum going again yesterday. I didn't take time to spin this weekend, because I wanted to finish off a pair of sock for daughter and get started on Mr. Greenjeans. Mr. Greenjeans is a great pattern so far. It's knitting up quickly. I also like the yarn, so that just makes it even better. That's about it....it's just another Monday. Lucky husband had today off for Veteran's Day, and he's spent it outside mowing the south 40. The yard looks tremendously better. We didn't have any grass, but the leaves were out of control. I finished up the Boogie Vest this week, and man, am I disappointed. First, when "they" say that bulky weight yarn looks bulk on bulky weight women, "they" are telling you the truth. Second, the neck shaping (or lack thereof) on this vest is not apparent in the photos provided in the pattern. The neck opening as written was much too wide, in my opinion. I ended up closing another 1 1/2 inches on either side of my vest. Third, and this is entirely my own fault, the yarn I chose sheds like crazy. I'd recommend that you stay clear of Bernat Alpaca unless you particularly like walking around looking as if you rolled in the dog's bed. I don't have any photos of the lovely vest, but here's an idea of how it looks on me and what it reminds me of. Pretend the vests in the photo are not open on the front but pullovers. I am loving this. I've gotten almost a week worth of posts out of one fiber event! 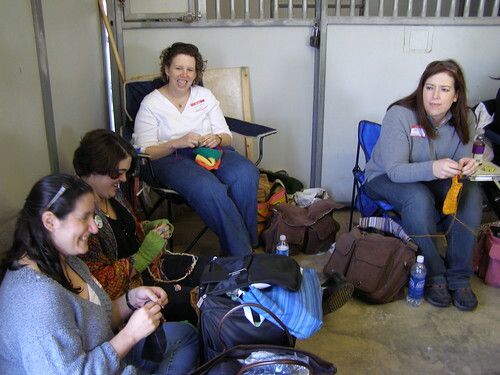 Here are the remainder of my SAFF photos, all taken at the Ravelry meetup. I know you wish you were there! ahem, yes, Judy and Bev, I'm talking to you! Mark October 24-26 on your calendars right now! Is that the elusive ESC there in the denim shirt? 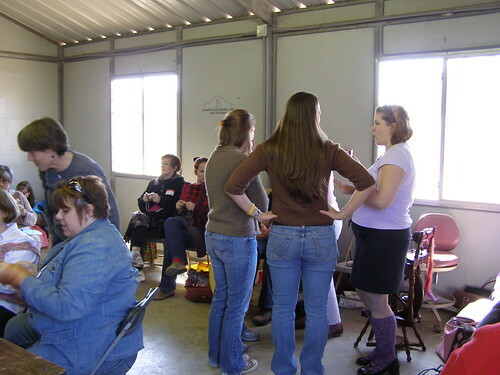 This is Rachel in the white shirt and Jen aka Meangirl by her. I don't think Rachel has a blog, but she's oneofestelles on Ravelry. My Boogie vest knitting is all done. I finished it up last night. This was a really quick knit. I'm going to try to get the shoulders attached today if work doesn't go to hell in a handbasket (which is par for the course at my job). Looks like I'll make my Nov. 17 self-imposed deadline to get this vest in wearing order. Pictures will come later. It was 30 degrees when we woke up this morning. This is awesome. I'm ready for cool temps. I had to break the ice on the bird bath this morning (a very thin layer, but still, it was ice). The furnace guy comes tomorrow for our annual inspection. I'm almost ready to build a fire in the fireplace, too, but that means I need to get the chimney sweep out here first. Ah, fall and winter! I love it! This post will be picture heavy. 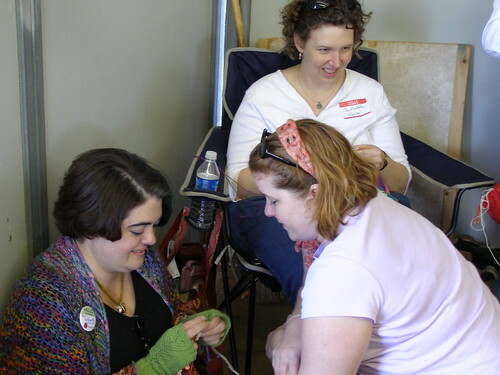 The photos are from the Saturday Ravelry Meetup at SAFF. E-mail me or leave a comment if you know who everyone is! I don't have all the names. 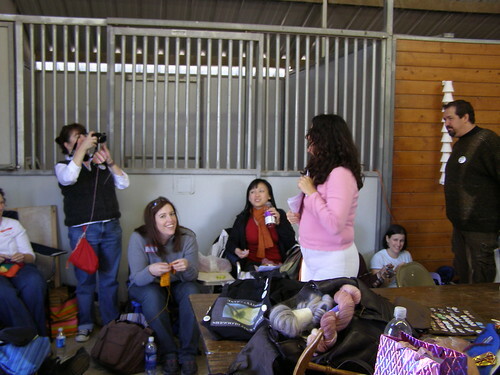 Claudia on the left, and I think that's Brett The Yarn Doctor beside her. 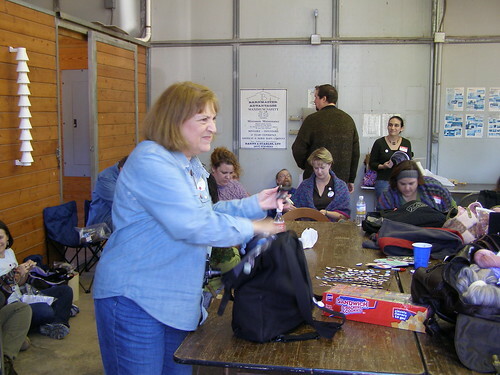 That's Sandy in the white shirt, and Katey to her right. Pam, Amie, and who is that in the white shirt? I blogged Zonda blogging her sock. 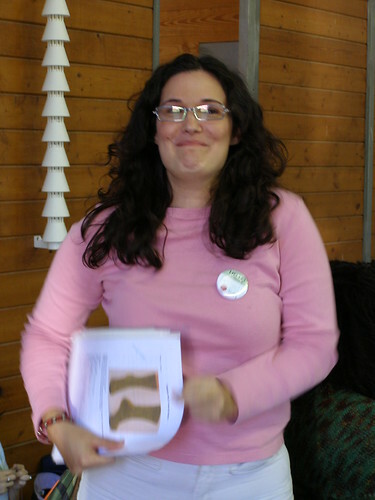 Cristi with her set of Wendy Knits patterns. Wow...I've got so many pictures left, looks like I can squeeze one more post out of this! More to come! First, let's address the comments. (I don't have a fancy schmancy commenting system that lets me e-mail folks.) Bev, yes, that lace weight yarn at In Stitches is calling my name, too. So is that yummy silk with the beads (that isn't Tillie Tomas!). Zonda, brilliant minds, dear! I was thinking that the Boogie vest could easily be worked in the round. I want to make another one, too, in a more fun color than charcoal! Cristi, Cristi--me? Point a finger at you because of garter stitch hell? Never! ;) Actually, Donald has an inexpensive knitting machine, and we're thinking of whipping up a couple of jackets on that. Next, on to new business. My Boogie vest is close to being done! I finished knitting the back and am about a quarter of the way done with the front. The chunky yarn combined with size 10 needles makes for a quick knit. My goal is to have this thing done in time to wear to Guild on Nov. 17. I mentioned that I'd picked up The Knit Stitch this weekend. I don't know why I avoided this book for so long. There are a lot of neat patterns in it. Yes, you'll be in garter stitch hell to make any of them, but the results are pretty cool. I think I'm going to have to add The Purl Stitch to my collection, too. We have a new to us book shelf, so maybe there's room to slip in a couple of new books, eh? Please, Mom, no more photos! All smiles on Sunday, probably because she got a new sweatshirt. 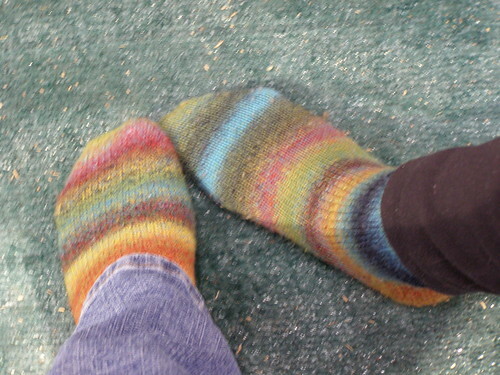 Vera and I both had on socks made from Trekking XXL color 100! More to come tomorrow.....Ravelry Meetup (Saturday) pictures! My Lendrum also has me annoyed. It's not acting right for some reason. Maybe the wheel wants to be back in Asheville spinning. Wouldn't that be nice? My resident man who can fix anything is going to try to get the wheel going again. He suspects there may be something in the Woolie Winder making it act up. The treadling is really hard, and the yarn take up is nil. That's not at all like my Lendrum. Hopefully, we can get things back in line so that I can spin a bit tomorrow. Husband and I both needed a little break from life today, so we headed out to our favorite LYS, In Stitches. 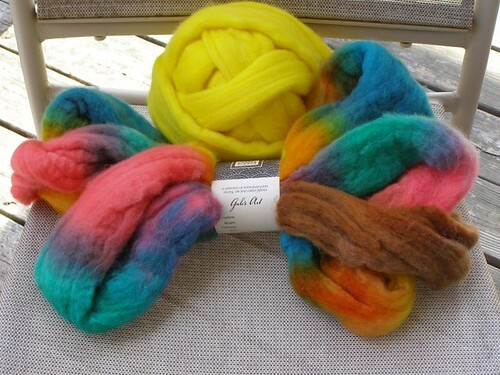 Barbara has some drop dead gorgeous new yarns in--silks and cashmeres, and mohairs, oh my!! Husband said he'd love to just take a day and go sit with Barbara to knit. She's such a nice, low key person. I can hear Bev now saying we need to come to Knit Night. We're trying!! We also made a quick stop off at Michaels for some bulky weight yarn. I know, I know. I'm experimenting with this and felt somewhat better about spending just $3 a ball on the yarn there to see how I liked the pattern. I am using Bernat alpaca, an acrylic/alpaca blend. My vest will be in charcoal grey which is a nice go with anything color. Zonda, is this the vest you were wearing last weekend? Thanks to Cristi, I have Einstein Coat on the brain, so...off to Borders. I picked up a copy of The Knit Stitch and found that there is a lighter weight version of Einstein in the book. Lucky me, I have enough yarn in the stash to make myself one!! I'm going to cast on for that as soon as the vest is finished. It was chilly here today, so I wore Klaralund out on our little shopping trip. Two people stopped me in Borders to ask if I'd made the sweater myself and to say how much they liked it! I also got loads of compliments from Barbara and when we stopped by the other LYS. Yes, I know...no SAFF stuff today. Maybe I can get those photos uploaded tomorrow and treat you all to some people pix. Oh, Linda, you left a comment that we may live near each other. According to mapquest, we are 2 1/2 hours apart. 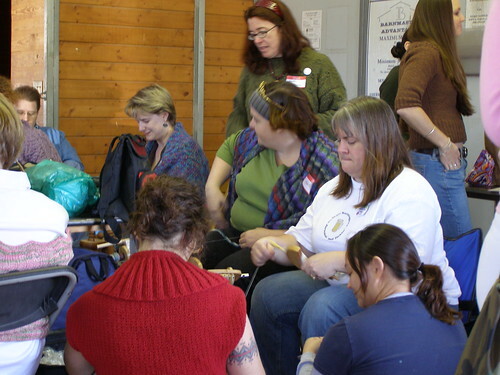 If you are looking for nearby knitters/spinners, you may want to look towards Atlanta. I'll e-mail you some info about the next Guild meeting! I've finally found some time to take photos of my SAFF loot. I told you I'd been very good about not blowing the budget. I mainly bought fiber to spin. 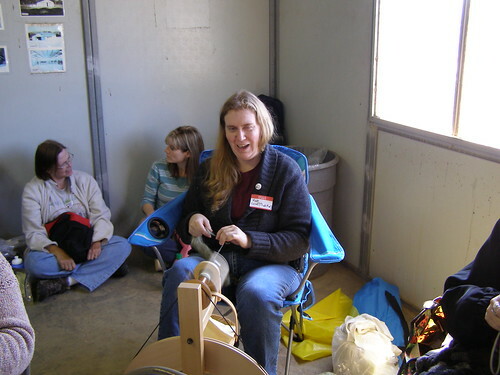 All of my fiber came from a lady named Tina Evans who is in our spinning guild, the Peachtree Handspinner's Guild. Her fiber is heavenly! 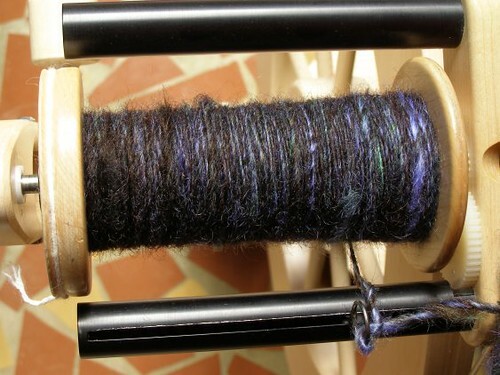 This is a mix of Blue Faced Leicester, Cotswold, and Mohair. I got 8 ounces of this. The colors are black, green, and blue. They remind me of the Black Watch tartan colors. This picture isn't that great, because that mohair just wants to shine in the light! The color is much more rich in person. 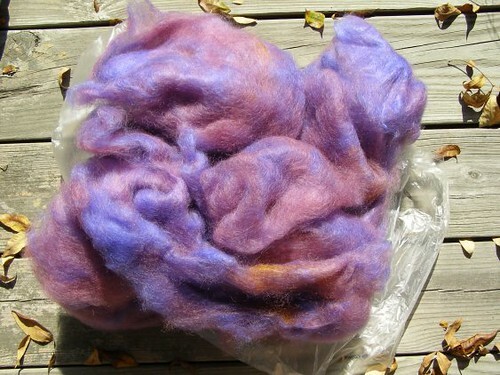 Next is another Blue Faced Leicester, Cotswold, and Mohair mix, this time in brighter colors of pink, orange, and deep lavendar. This must have been a popular color, because Tina only had 6 ounces left on Sunday, and I got it all. Finally, here is some Cotswold, BFL, and sparkle mix. 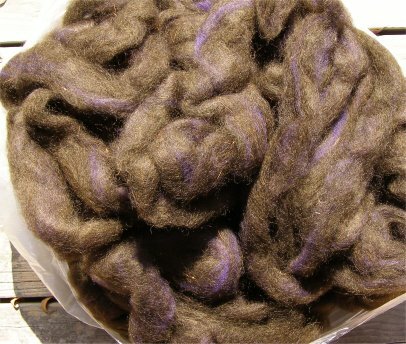 You can't really see the sparkle in the photo, but it is a coppery color that goes well with the brown and purple wool. I did not buy any yarn at SAFF, but I did sneak out to Yarn Paradise to spend a gift certificate I've had since last Christmas. I ended up with 5 skeins of Malabrigo worsted weight. It was intended for a shrug pattern a bunch of us bought at SAFF (Susan's Shrug by Maggie's Rags), but the yarn seemed inappropriate for the pattern. 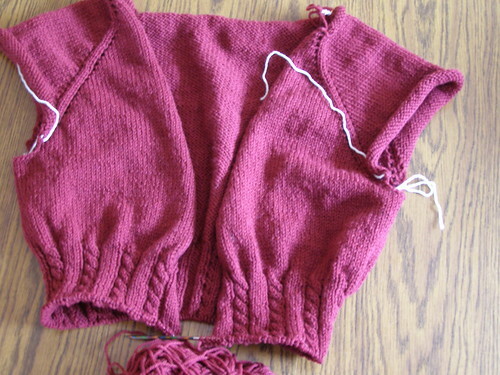 Instead, I'm knitting the Ester shrug from Knitty. 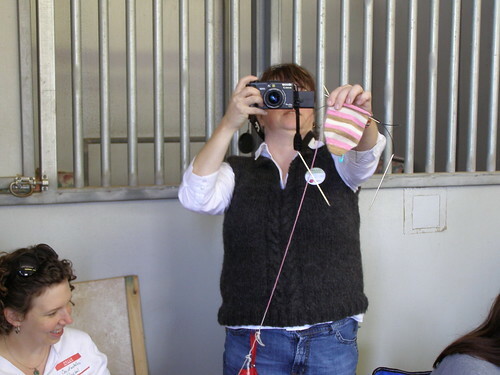 The knitting in this photo is not Ester. 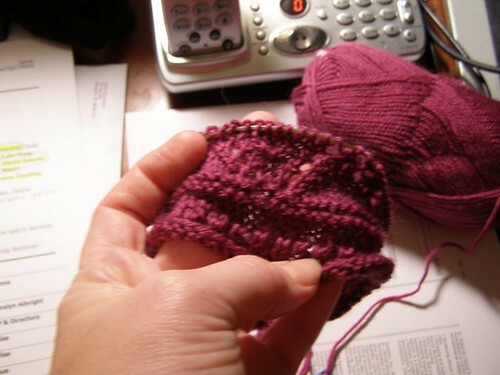 The yarn has since been frogged, balled, and knitted into the first few rows of Ester. I don't have pictures of Daughter's stash. She really didn't get all that much either--primarily spinning fiber including a silk brick! I won't share photos of the two Christmas gift items I bought either, so you'll have to wait until December for those. 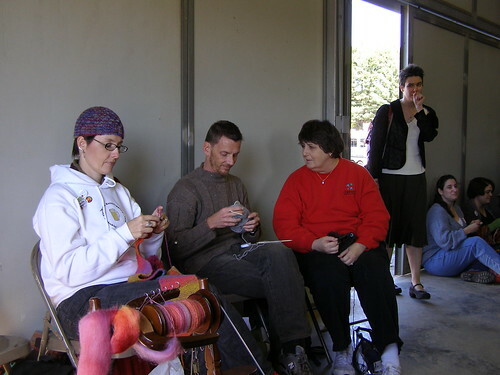 This weekend, I'll post photos of the most divine yarn bowl in the world and of some of the most divine people that I had the pleasure of meeting at SAFF.